You look in the mirror and do not want to see your own reflection. Your goal is to have a perfect body but all that you have is this “body-bag”. You don’t know where to begin. Don’t be gloomy! Now is high time to achieve your goals. We want to help you to make your dreams come true. Before we get into the best workouts for weight loss, let’s make some things clear. Firstly, you should stick to a diet. There are many types of diets. Before choosing a diet you should consult with your doctor. The wrong diet can harm you. Be careful! Stop eating junk food and try to drink more water. In this way you can get rid of excess body fat and strengthen your muscles. The next step is training. Remember that both cardio and strength exercises should be involved. To get the most out of your cardio workouts find a variety of physical activities you like to do. Walking, cycling, swimming and even dancing count. 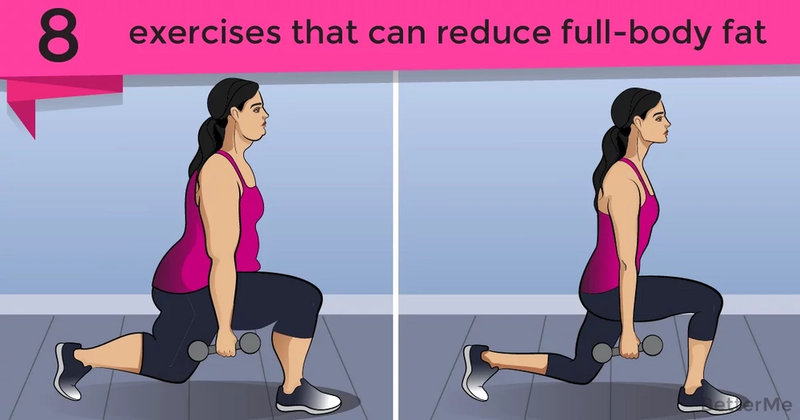 Each activity will work your body in different ways, which will help you lose fat. Strength training is a perfect activity for fat loss too, although doing it doesn’t directly burn more fat than cardio. The strength workouts will build muscle and muscle burns fat 24/7. The more muscle you have the better your chances are of losing body fat. Today we have 8 excellent exercises for you. This training program will help you lose weight and tone all the main muscles of your body. Let’s try it!